Official Description: You and your team are a group of military personnel who have been assigned to a critical covert mission. Your objective is to stop a major international threat by gathering details on an impending attack. In this thrilling high-stakes mission, it’s up to you to get inside the heads of the masterminds and infiltrate their evil plan. Difficulty (official): 7/10, in the middle range of difficulty in their offerings. Difficulty (experience): Average, not too simple and not too difficult. Review: I had the opportunity to experience a game in Austin as part of a team-building exercise separate from the usual author of these reviews. I am fortunate enough, however, to work with one of our usual escape partners. As we were a large group, I called The Escape Game Austin well in advance of our visit for a corporate booking. They do have an experience that accommodates up to eleven participants, but we expected to have a larger number of players and we opted to pick two rooms that would support our total number. While some of the managers ran off to recover stolen artwork in The Heist, our group of crack agents dove into the terrorist underbelly in Classified to thwart a sinister plot. As we entered the room I was immediately thankful we had booked at The Escape Game Austin. Classified is one of the best decorated rooms that I’ve experienced to date. As we all took in the ambiance of the room (and slyly looked around for clues) we were presented with a video introduction to escape rooms and to the scenario we were about to play, both very high in production quality. After some additional tips, our game master left us to start our adventure and we began to make quick work of some of the room’s first, most easily visible puzzles. This was the first room I have played in which small items in the room that were not part of the game, or at least that did not need to be moved/removed, were all secured down in place. While there were still a number of items with which to interact in the room, this helped us focus our attention away from certain areas which likely helped us blaze through the first few puzzles. While none of the puzzles were difficult, we did run into a few snags as we missed a couple of details and fought with what I believe was a mechanical failure. While we were able to complete the puzzle, the game master’s explanation did not seem to differ from our approach which cost us significant time in this game. Nevertheless, we did discover all of the clues in the game, and came to their logical solutions as intended. There is a linear quality to the first act of the escape with several simple puzzles. A larger group may feel that they are standing around a bit if they aren’t the first to a particular clue, but after the first few puzzles are solved, many more opportunities are available for an entire group to explore. The room does have standard escape room fare like traditional padlocks and a combination safe, but it also incorporates some tech and a fun, mechanical puzzle that was rewarding when we discovered the solution. Ultimately we didn’t find the puzzles themselves to be the most difficult, but the room took us nearly the entire time to escape (again, with the mechanical “failure”). We returned to the lobby to meet the other half of our group,who had beat our escape time by a full ten minutes on what the operator described as a slightly harder room. Still, we enjoyed the room and the escape room newbies who were with us also all had nothing but positive things to say about their experience. They were lucky, we chose a great location for our event. Hints Used: 4, with unprompted hints given when we veered a bit off track. Clue Quality: Good. Clues are uncomplicated without being too direct. Nothing is difficult to understand or unclear. Puzzle Creativity: Where the puzzles were simpler, their discovery was novel and exciting. Other puzzles used varied and unusual methods for discovery and solution. Fear Factor: None. The subject matter is a little dark but nothing is intentionally scary. You are excluded from a visible section in the room at the start of the game which makes the space a little crowded at first, but this doesn’t last very long. 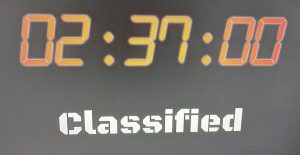 Things to note: There is one section of the game that may be challenging for an individual with mobility concerns, but it can be completed by just one member of the group or, failing that, can be skipped due to necessity with the assistance of the escape room staff (they are quick to point this out). There is paid parking in the garage above the escape room or on the street (carpooling is encouraged). The Escape Game runs monthly contests on their Facebook page and runs promotions on Groupon.